Utilising the High Chemical Resistance of Polyethylene, this range of Deep Bunds provides for many applications requiring secondary containment of Dangerous Goods. Common applications include Dispensing & Storage of Hazardous Chemicals, also suitable for the collection of used/contaminated spill control media. Installation: Bunds are self supportive and simply require placement on a firm flat surface. 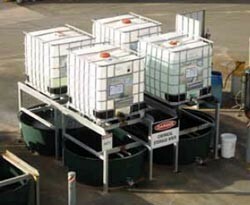 High Capacity Rectangular Bund solutions are also available for dispensing & storage applications involving Diesel Fuel, Hypochlorite, Caustics and more. These Bunds can be customised to suit specific applications. See more Handling & Spill Containment products in the Dangerous Goods section.